Hurricane evacuations: Never an easy decision. By Samra Jones Bufkins, MJ, APR. As I write this, I am watching news coverage of the aftermath of Hurricane Irma, which produced the largest mass evacuation in U.S. history. Hurricanes are big, destructive storms, terrifying many people in their paths, but modern forecasting technology makes it easier to predict the areas that will be affected. People living in those projected areas need to be safe. As the old saying goes, you run from water, you hide from the wind. Evacuation of low-lying areas is proven to save lives, as it probably did with Hurricane Irma. However, mass evacuations have their own problems, and there is much discussion about how to efficiently transport millions of people out of harm’s way. Hurricane Harvey, which hit the Coastal Bend area of Texas in late August, 2017 before going back out to sea and moving northeast to sit over and flood the Houston area, is a case in point. After the Houston Metropolitan area received 55” of rain, flooding much of the city, people started criticizing the mayor and other officials for not evacuating the city. As a survivor of the evacuation ahead of Hurricane Rita in September, 2005, I think they made the right call. Barely three weeks after Hurricane Katrina devastated New Orleans, coastal Mississippi and Alabama, Hurricane Rita unexpectedly grew to a category 5 hurricane, bearing down on Galveston Island with alarming speed. Based on storm surge projections and floodplain maps, officials ordered an evacuation of people in vulnerable areas. Millions of people from Corpus Christi to Beaumont packed up and left for higher ground. On paper, Houston and Galveston had what appeared to be a good plan. Starting with the barrier islands, people were instructed to leave in stages, based on their geographic area, with those in the most danger going first. Beginning Wednesday, Sept. 21, traffic streamed north on the Gulf Freeway as thousands of people fled the island and coastal areas. Houston mayor Bill White called for the city to be evacuated, emphasizing those areas subject to storm surge flooding. We were in a mandatory evacuation zone because our house was near Clear Lake and Galveston Bay. Our assigned departure time was 3-5 am Thursday, Sept. 22. My husband and I were in the process of putting our house on the market. Bill was already working at his new job in Dallas, and I had quit my job to prepare for the move. He left work in Dallas early on Wednesday and drove to our home in Bay Area Houston to help me load up and evacuate. When Bill arrived about 9 p.m. we packed the truck and the car, hanging the bicycle rack on the back. We got to bed about midnight and slept restlessly for a few hours. At 3 am we received a reverse 911 call with a recorded message by Mayor Bill White, telling us we should be getting on the road. We made a final check of the house, secured our bicycles on the bike rack, packed the cats into crates in the car, and Bill took our basset hound in the truck. When we closed and locked the front door at 4:45 a.m., Rita was a category 5 storm headed for a direct hit on our area. We weren’t sure if we’d have anything to return to, but I left the porch light on. Thus began a journey none of us will ever forget. We hit the Gulf Freeway and headed north at a normal speed, listening to the radio for traffic reports. Remember, this was 2005, before all the gasoline and traffic apps we have today. As we got closer to the South Loop, traffic slowed. Bill called me and suggested we take the Hardy Toll Road, which began north of downtown Houston. We got off I-45 and snaked through deserted side streets until we got on the toll road. Where we sat, without moving more than a couple of car lengths at a time, for six hours as the temperature approached triple digits. On the radio, Mayor White and County Judge Bob Eckels were begging Governor Rick Perry to authorize removing the concrete barricades and allowing northbound traffic to drive on the southbound lanes. Those pleas were rebuked with excuses like “we’d have to get cranes down there to remove the barricades.” The logistics of blocking more than 100 exit ramps to prevent head-on collisions would also require hours. Meanwhile, 3 million people were sweating on a hot freeway, with some getting sick from the heat. To save fuel, many of us turned the A/C off. The state eventually agreed to open contraflow lanes, but we had already inched past the opening on I-45, and they wouldn’t let cars enter the southbound lanes directly from the exit ramps. In other words, northbound lanes were gridlocked, and the few cars in the southbound lanes whizzed by, safely on their way to Dallas. Low on gas, about 10 p.m. we got off the freeway in Huntsville. We had gone 95 miles in 17 hours. There was no fuel or food anywhere in Huntsville. I was ready to check in to the state penitentiary just to get off the road. Ninety minutes later we gassed up both vehicles, got some snacks and caffeine, walked the dog, and chatted with people in the parking lot. Locals in the tiny community of Roans Prairie had come out to direct traffic, make coffee, check the restrooms and provide comfort to strangers. We had pretty smooth sailing from there, taking back roads and I-35 to Waco. Cars and trucks were pulled off on the side of the road, with families camping there. Convoys of utility and supply trucks headed south. It was an eerie spectacle reminiscent of some apocalyptic movie. About 3 am we pulled into a church parking lot where several other families had parked to get some rest. One man was planning on staying awake all night with his shotgun, willing to protect us all from crime. The next morning, many fast food places were running out of food and coffee. We headed up to Bill’s Dad’s house in Denton. When we arrived about 10 a.m., we had been on the road for 29 hours. I’m sure there are similar stories coming out of Florida and Georgia as people flee Hurricane Irma. Could a mess like this been avoided? Maybe. But there are things people could have done to minimize the agony. Bill and I took two vehicles. I know we weren’t alone. Most of my neighbors took two cars, and we talked to people along the way with as many as four vehicles per family. That had to contribute to the gridlock. We Texans love our cars, and when faced with losing everything left behind, knowing you have a car gives you confidence as well as one less thing to repair or replace. Looking back, we could have left the bicycles and a few other items, put the cats on the back seat with the dog, and made the trip in the truck. But how would you limit families to one car? What about large families or those with lots of pets? I’m not sure there’s an equitable way to manage this, other than urging people to leave earlier. Another factor contributing to gridlock was the thousands of people well inland who decided to evacuate, clogging roads and using up resources along the route. This phenomenon is called shadow evacuation, When people inland of mandatory evacuation zones decide to leave, they often get in the way of people truly needing to get out. For example: about 11:30 in the morning I got a call from a friend asking if we wanted to have lunch in College Station. Lunch? I just wanted to get off the Hardy Toll Road. These friends lived near downtown Houston and the Heights, well above any flood danger, and 50 miles inland. When I realized we weren’t going to be off the road by dark, I called a former colleague who lives in The Woodlands, hoping to crash at her house. She said they were in Dallas at her brother’s house. All their neighbors left when they did that morning. The Woodlands is a good 75 miles inland. Many people with no need to evacuate left, either out of fear of another Katrina, or to avoid the inconvenience of being without power for a few days. Add in the fact that thousands of people from New Orleans were in Houston—and undoubtedly didn’t want to ride out another hurricane–you have a recipe for gridlock. Approximately 100 people died in the Rita evacuation, from heat-related illness, stress or accidents. Deaths included 24 nursing home evacuees who died when their bus burned on I-45 south of Dallas. That nursing home was near the Houston Galleria, well away from storm surge or potential for wind damage, and was not even close to a mandatory or voluntary evacuation zone. After Rita, coastal counties and the governor made changes in procedures, and when Hurricane Ike approached Houston in 2008, contraflow lanes were considered, although not needed or implemented. Houston has survived major flooding from storms in the past, without evacuating ahead of time. People will debate the decision not to evacuate until the next storm comes along. When people evacuate and the storm changes course—as Rita did—they become angry and complacent the next time a big storm blows through. Despite mixed messages by government officials, fear of another Rita was probably at the root of the difficult decision made by the mayor and Harris County judge. Watching six or seven million people struggling to evacuate south Florida this week brought back bad memories. As sad as I am to see the suffering of people stuck in flood waters in Houston, I still think they made the right call not to evacuate. Lets hope the powers that be prioritize infrastructure improvements and communications to avoid future debacles during natural disasters. 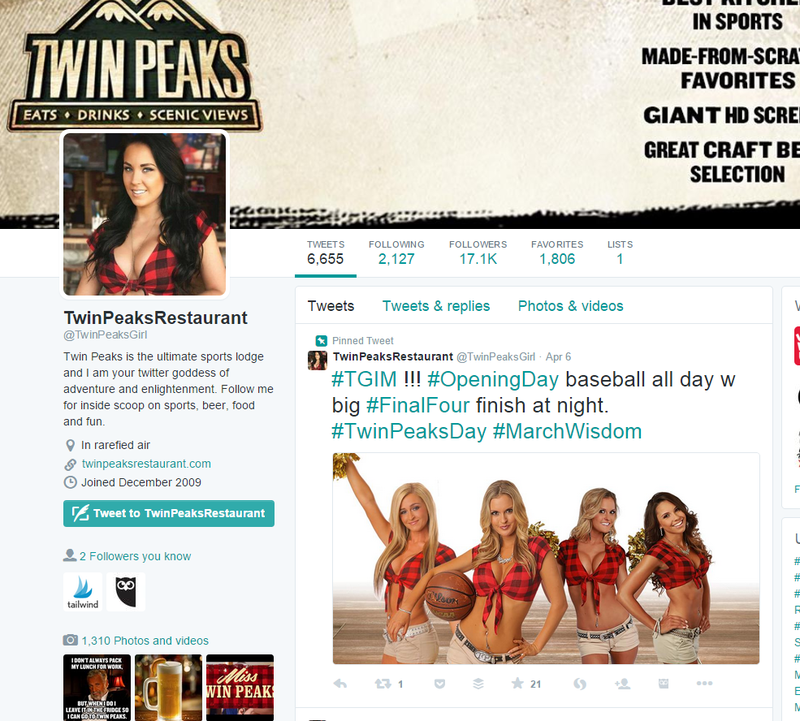 It’s a little more than 48 hours after a biker gang brawl in the parking lot of the Waco breastaurant Twin Peaks, (killing nine, injuring 18 and resulting in the arrest of 170) and there’s barely a word from the Twin Peaks corporate office. Is that enough? I don’t think so. It’s admirable the company shut down the franchise within a day (the TABC pulled their liquor license ) but what else are they doing to contain the damage to their image? Looking at their Twitter account you see they still have a Major League Baseball Opening Day tweet pinned to the top of the page–folks, that was April 6. I’m pretty sure my students, along with any half-decent crisis communications manager would recommend they pin their tweet about the carnage to the top of their page. I even tweeted that suggestion to them several hours ago. I’ll let you know if they do it. So what’s a company to do in a situation like this? 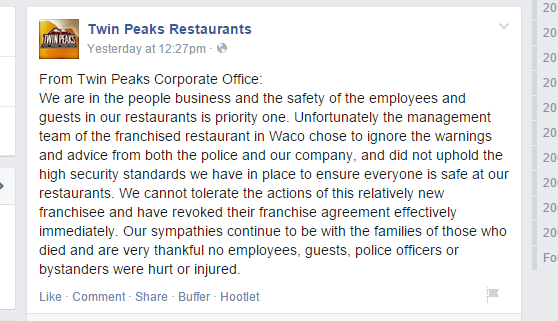 The franchise owner claims they cooperated with police but the Waco police claim they warned the restaurant about the possibility of violence and were ignored. Before it was taken down the local franchisee’s website apparently promoted regular “bike nights” catering to motorcycle groups. This story isn’t going away soon. Most people don’t know the difference between a franchisee-run restaurant and a corporate-owned location–they see the name and that’s it. When you consider my public relations motto “If the public thinks you have a problem, you have a problem” in that context, Twin Peaks has a problem. I’m sure they would love to get the signage off the side of the building while it appears as the backdrop for all the police press conferences, but they can’t get in because it’s a crime scene. It wouldn’t matter anyway–the name is out there and isn’t going away soon. The company is doing little to mitigate the damage to their name. What would I recommend? It could be “too little too late” but Twin Peaks needs to post a message on every landing page of their website decrying the violence, confirming their closing of the Waco franchise, and offering their sympathy to the families and loved ones of those killed. They would also do well to offer some sort of assistance to the many people left unemployed by the sudden closure of the restaurant–counseling for the witnesses, a job fair, training–something that might help these innocent people get over this trauma. Take care of your people, Twin Peaks. There are plenty of places to eat.